On Episode 205 of CrossFit Radio, host Justin Judkins interviewed Practice CrossFit trainer Mindy Coby and goal-setting guru Greg Amundson. This episode was webcast live at 6 p.m. PDT on Wednesday, Jan. 4, 2012. 3:45 In addition to being a trainer at Practice CrossFit, Mindy Coby is an elementary teacher and girls basketball coach. She came on the show to talk about how women are influenced by society’s definition of health and beauty. She explained how her attitude and self-image changed once she started CrossFitting, and she described how rewarding it is for her to help the young women and clients she coaches understand how beneficial it is to have a proper outlook on health and fitness. She also talked about her athletic background and how she became a trainer at Practice CrossFit. 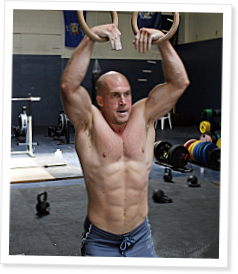 30:10 Greg Amundson is the original CrossFit Firebreather and has now become a subject-matter expert (SME) on goal-setting and motivation for CrossFitters. He came on the show to talk about how to set and accomplish difficult goals no matter how hard they are. Amundson described how he started giving the CrossFit Goal Setting Trainer Course and talked about what it’s like to present this curriculum around the world. He described the new job he has taken with CrossFit in addition to being an SME, and he said everything he has accomplished outside of CrossFit is because of CrossFit. On Episode 214 of CrossFit Radio, host Justin Judkins interviewed CrossFit Catalyst owner Chris Cooper. This episode was webcast live at 6 p.m. PDT on Wednesday, March 7, 2012. Ref episode 205 and your discussion with Mindy re form and standards of movement from the Open to the Regionals! Given that all open workouts are either done at an affiliate or verified online by CFHQ there should be no reason for any disparity in standards from the Open to the regionals what so ever. It was a big issue last year as the standards for the open and the standards for the regionals differed on some exercises, box jumps comes to mind! These inconsistencies need to be hammered out by CrossFit HQ and standards need to be set early and followed. What about all the athletes that are currently preparing for the Open! What standards are they supposed to follow. Will it be hand release burpees / bar facing burpees / burpees onto weight plates! Shake it up once and for all on the different movements. Set the standards, let everyone know about it and then ensure consistency and tight policing throughout. The comments made in this podcast about the difference from Open to Regionals last year throws a certain amount of egg on the face of CrossFit as it was CrossFit certified people that were entrusted to keep the standards of movement clean and correct in both situation but in the end it was one of the most talked about subjects as there were so many differences......possibly from regionals to regionals too!! !